Freeman at the 2012 Golden Globe Awards. Morgan Freeman: He&apos;s known for many things. He&apos;s played God in too many movies to count, as well as the President. He voiced a surprisingly tear-jerking film about penguins. But lately, he&apos;s been in the news for less-than-flattering reasons. 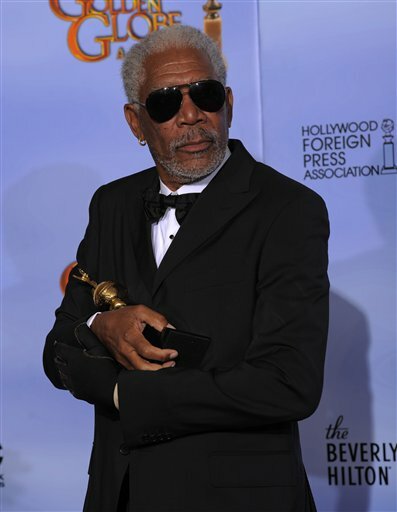 The National Enquirer reported in 2009 that Freeman&apos;s wife had left him because of a relationship the actor was having with a stepgranddaughter from a previous marriage. Now, further gossip alleges that he plans on marrying the young woman. "OK, so, in a great world like this where we are currently $1000 away from sequencing the human genome -- that&apos;s true, look it up, stop making that face -- being young and staying young is easier than ever. And nowhere better is this illustrated than in the life of celebrity narrator and featured celebrity master of every movie ever made, Morgan Freeman. So yeah. Old Hoke has been driving Miss Daisy for a lot longer than anyone knew about -- including his wife, whom has divorced him on grounds that, well, he&apos;s been marching the penguin behind her back. And why not? When you&apos;ve been like, alive for 72 years, you&apos;re bound to get a little crazy, right? I mean, think about it: You&apos;ve been on the earth for seven decades plus two more years. He&apos;s seen the world change so much; lived through war after war, president after president. And then the tech revolution hit in the &apos;80s and there&apos;s that bullsh**. I mean &apos;cmon: I&apos;d go deep impact on a 20-year-old after that and never feel bad about it."